Raymond Audy and T'ang Haywen met in Paris in 1951 or 1952 at the École des Langues Orientales and were close friends until T'ang's death in 1991. 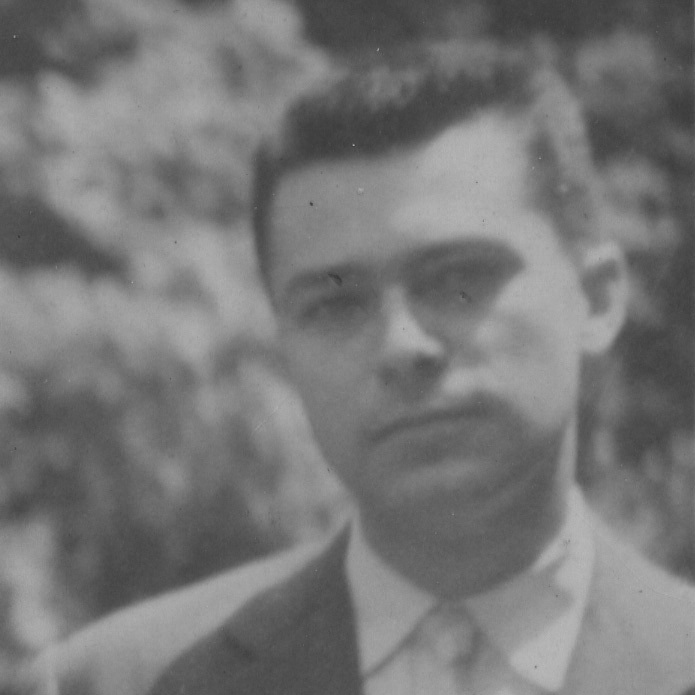 Raymond remembered meeting this elegant young man, most of the time dressed in a perfectly cut suit, and who lived all year round in a hotel in the Latin Quarter. Haywen at that time still received from his father, a silk merchant in Saigon, a generous monthly payment that allowed him to enjoy Paris under the best conditions. Raymond, like most true Parisians, came from the provinces, from his native Touraine, where his family owned a baroque house - Villa Caroline - built by a theatre owner on the banks of the Loire. Raymond was a great lover of theatre, poetry and literature and Haywen had joined the troupe of the Antique Theatre of the Sorbonne. 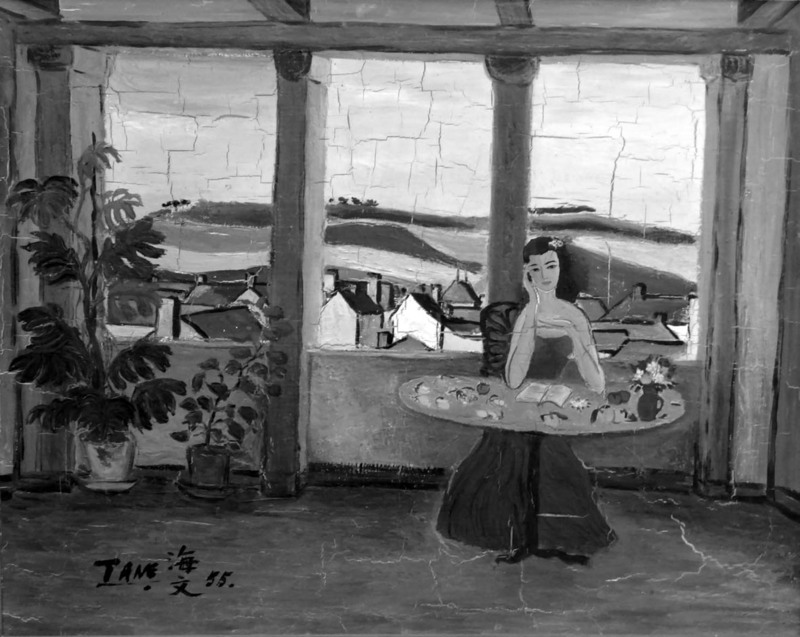 In 1952-53, T'ang decided to devote himself to painting, but from 1954 his family stopped sending monthly payments. T'ang paints landscapes, plants, flowers, portraits and still-lifes. Raymond supports him by acquiring works that he will collect all his life. During a stay in Touraine, T'ang paints a picture set in the "pigeon house" of the villa, a room that dominates the surrounding countryside: a brunette and elegant woman sits at a table in front of an open book, fruits and flowers. With one hand pressed against her face, she looks at the spectator with gentleness and serenity. Behind her, large windows open onto the rooftops of the village and the productive fields. It is summer and T'ang surprises this beauty in the midst of meditation; unless he announces her coming... because some times later Raymond attends a theatrical performance and falls in love with one of the actresses, Caroline Waldé, who will become his wife. The painting remained hanging on the wall of the house's dining room for more than forty years, before joining an important Parisian collection. Raymond served as a soldier in Algeria where he met the poet Marc Alyn, whom he introduced to T'ang in 1960. in 2018, in his memoirs, time is a falcon that dives, Marc Alyn devotes a chapter to T'ang and writes: "On the flower corollas born from his hand, bees come to rest". At the end of March 2019 Marc Alyn will publish a collection of poems in homage to T'ang - T'ang l'obscur, Mémorial de l'Encre - illustrated with works by T'ang. For the rest of his life, T'ang will go once or twice a month to dinner or lunch with the Audy-Waldé family. Raymond said of him "that he spent most of his time exercising his freedom". It was after a Sunday lunch at their home that T'ang, feeling very unwell, discovered that he had contracted AIDS. The Audy-Waldé family watched over him until his death on 9th September, 1991.